ein hod: Are there no men who can live up to their standards? Are there no men who can live up to their standards? 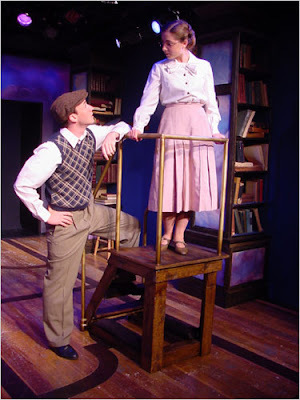 The New Jersey Repertory Company here has always had a taste for the unusual, and the genesis of its current production, a world-premiere musical called “Bookends,” is suitably quirky. The piece came about when the woman who took Sidney Poitier home for dinner met the rare-book dealers who exposed Louisa May Alcott’s dark secret. “Bookends” tells the true story of Madeleine B. Stern and Leona Rostenberg, rare-book dealers in New York who for more than half a century were institutions among the bibliophiles of the city and beyond. In the 1940s, early in their business partnership, they made a discovery that changed the view of Alcott, whose 1868 novel, “Little Women,” has been a staple for generations of adolescent girls: they proved that Alcott also wrote a far more scandalous brand of fiction, anonymously and under pseudonyms. These were stories, as Ms. Stern put it in a 1995 interview, of “thuggism, feminism, hashish, transvestitism,” and the discovery helped kick off a long career of literary detective work and book buying and selling for the two. Four decades after the women’s best-known bit of sleuthing, their Alcott expertise led to the connection that eventually resulted in “Bookends.” The play was written by Katharine Houghton, who as an actress made an early impression as the daughter in the 1967 film “Guess Who’s Coming to Dinner.” (Her character’s mother was played by Ms. Houghton’s real-life aunt, Katharine Hepburn.) Ms. Houghton didn’t stay in Hollywood; instead she pursued stage acting on the East Coast and ultimately caught the writing bug.